A page from the 1942 edition of The Seminole, the yearbook for the University of Florida (UF) in Gainesville, Florida. A notable individual shown on this page was Samuel T. Williams (1922-1945), who is the first person in the third row. A native of Eustis, Williams served as a Private First Class (PFC) in the U.S. Army during World War II. He died during his service in France and is currently buried at the Epinal American Cemetery and Memorial in Dinozé, France. He is one of 85 Florida residents interned at Epinal. Williams was born in 1922. He enlisted in the Army on October 24, 1942, while attending UF. Williams was assigned to the 291st Infantry Regiment of the 75th Infantry Division. Williams' division arrived in Britain in November of 1944. They took part in a number of major battles, including the Battle of the Bulge in 1944 and 1945 and the Battle of Colmar Pocket in 1945. Williams died in combat around the Alsace-Lorraine region on February 3, 1945. 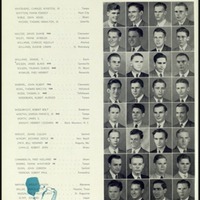 Digital reproduction of original yearbook page: The Seminole (Gainesville, FL: Senior Class of the University of Florida, 1942): George A. Smathers Libraries, University of Florida, Gainesville, Florida. The Seminole (Gainesville, FL: Senior Class of the University of Florida, 1942): George A. Smathers Libraries, University of Florida, Gainesville, Florida. Originally published by the University of Florida. Copyright to this resource is held by the University of Florida and is provided here by RICHES of Central Florida for educational purposes only. "The Seminole." University of Florida Digital Collections, George A. Smathers Libraries, University of Florida. http://ufdc.ufl.edu/AA00022765/00033/112j. "PFC Samuel T Williams." Find A Grave. http://www.findagrave.com/cgi-bin/fg.cgi?page=gr&GSln=williams&GSfn=samuel&GSmn=t&GSbyrel=all&GSdyrel=all&GScntry=7&GSob=n&GRid=56376369&df=all&. "World War II Honor List of Dead and Missing Army and Army Air Forces Personnel from: Florida." National Archives and Record Administration. http://www.archives.gov/research/military/ww2/army-casualties/florida.html (accessed October 20, 2015). "Electronic Army Serial Number Merged File, ca. 1938 - 1946 (Reserve Corps Records)." National Archives and Record Administration. https://aad.archives.gov/aad/record-detail.jsp?dt=929&mtch=1&cat=TS14&tf=F&sc=25005,25022,25006,25025,25007,25020,25028,25023&bc=,sl,fd&txt_25005=14077340&op_25005=0&nfo_25005=V,8,1900&rpp=10&pg=1&rid=111061 (accessed October 18, 2015). 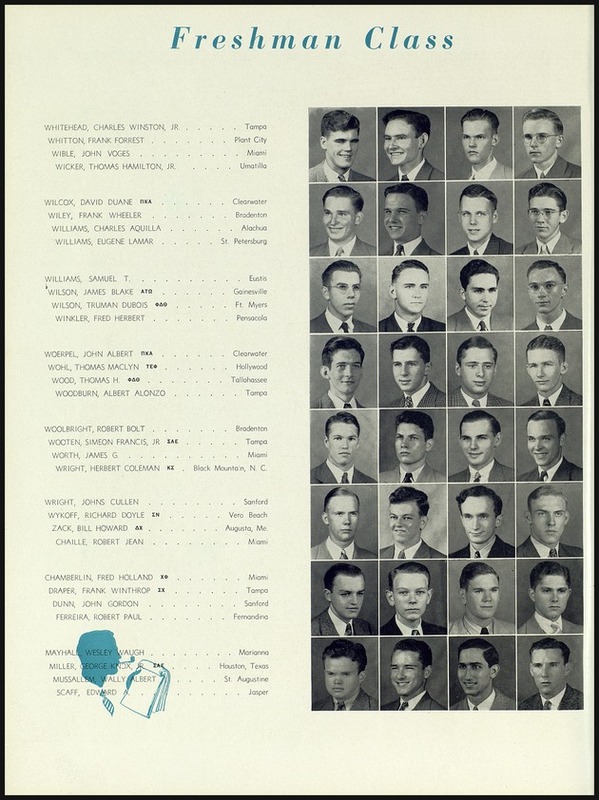 “University of Florida's Freshman Class, 1942.” RICHES of Central Florida accessed April 20, 2019, https://richesmi.cah.ucf.edu/omeka/items/show/6534.